A major threat to our online privacy has come back from the dead. Last year, thanks to a public outcry, the effort to pass overreaching cybersecurity legislation stalled in the Senate. Now supporters have reintroduced the House version of that legislation � the Cyber Intelligence Sharing and Protection Act (CISPA). It�s the zombie bill that refuses to die. The �new� CISPA is identical to the original CISPA that passed in the House last year � and poses the same threat to our digital civil liberties and our freedom to connect online. Take action now to kill the new CISPA. Just like the old CISPA, the new CISPA would offer companies like Facebook and Microsoft protection from legal liability when they hand over your sensitive online data to the federal government, without any regard for your privacy. The whole process would, of course, take place behind closed doors, with no accountability to the public. Tell Congress: Vote �No� on ANY cybersecurity bill that threatens our online privacy and freedom to connect. Last year, President Obama vowed to veto any destructive CISPA-like bill that reached his desk. 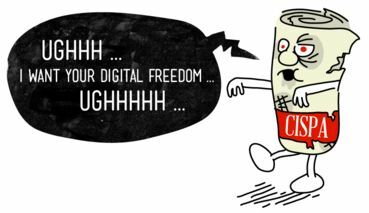 If CISPA becomes law, it will be a major blow to our online privacy. But more than that, it would have a chilling effect on our freedom to connect online. We won�t feel as free to state unpopular opinions, or to speak truth to power, if we know that Big Brother could get a feed of everything we say and do. This is not what the free and open Internet is about. Take action now to bury CISPA for good. P.S. Like our work? Free Press is powered by donations from people like you. We don�t take a single cent from business, government or political parties. Please keep us going strong with a gift of $10 � or more � today. Thank you! P.P.S. Wanna connect with people working to protect the open Internet? Come to the National Conference for Media Reform in Denver on April 5�7. Noted, signed & posted. They can have my digital freedom when they pry it from my cold, dead hands. Thanks JL. Signed and noted. Thank you JL. Kudos to Michael Kirby! Star on the way. Thank you for speaking out against CISPA. We'll be in touch as soon as the bill moves through Congress. signed, forwarded and noted, thanks ! You are welcome Joe, SuSanne and Roger! You cannot currently send a star to SuSanne because you have done so within the last week. You cannot currently send a star to Roger because you have done so within the last week. Noted and signed. One of the "freepress" decals lives on a window of my car. Thanks JL I had signed this previously but it allowed me to sign again. You cannot currently send a star to Edwin because you have done so within the last week. I signed, Thanks J.L. for posting, SuSanne for the forward! You cannot currently send a star to Henriette because you have done so within the last week. Thanks J.L. for the post and the link. Post read, message signed, sent and post noted. "Thank you for speaking out against CISPA." You are welcome Judy and John. Thanks for the extra effort Lynn! You cannot currently send a star to Lynn because you have done so within the last week. You cannot currently send a star to Judy because you have done so within the last week. You cannot currently send a star to John because you have done so within the last week. You cannot currently send a star to Julian because you have done so within the last day. Thank you for speaking out against CISPA. Please also sign this Petition on same issue. Thanks for posting the link to the additional petition Dandelion! You cannot currently send a star to Christeen because you have done so within the last day. You are welcome JL A and thank you for the green star. Thank you for speaking out against CISPA. Thanks J.L. & Dandelion. Noted, signed, and shared. Bless all who care!! Absolutely signed & noted. Much thanks, J.L......and Dandelion for the link. You cannot currently send a star to Lois because you have done so within the last day. Thanks J.L and Dandelion for bringing this to our attention..!! Signed two petitions and posted to FB.... We don't want this to pass..!!!!!! !